You might assume that a slot called Big Thunder would be about the Norse God 'Thor' or something equally thunderous. 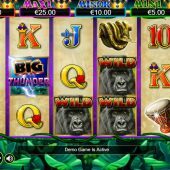 However, this is not the case with Ainsworth's online video slot Big Thunder, which is set in the jungle with a mighty Gorilla taking centre stage. Land-based slots players may have already played Big Thunder in casinos. This one is almost the same, with a few adjustments in this 'King Strike' adaption. There are 30 paylines over 5 reels and 3 rows plus a single-symbol reel on the left of the middle row. The other symbols are waterfall, drum and snake and there are the usual card symbols for lower pays. The game doesn't have a musical soundtrack like many but simple noises for spinning and any wins. The Gorilla is the Wild and appears only on reels 3, 4 and 5 stacked, but is very frequent! The highest-paying 5-of-a-kind is the scatter offering 50x stake whereas for symbols it's only 5x stake, for which there is a reason we shall see in the bonus. There are 4 built-in jackpots you can win by landing certain 5-of-a-kind wins on the screen when a Crown also appears on the 6th. single-symbol reel. So 5 of the lower card symbols on a win-line combined in any mix with the Crown will pay the Mini Jackpot, the same but with higher card symbols the Minor, with lower premium symbols the Major and higher premium symbols the Mega. These are fixed amount that are increased with your own play. Three or more Big Thunder scatters anywhere triggers 15 free spins. These are unique in design and work very differently to what you may be familiar with! Firstly the card symbols disappear and the Wild Gorillas now appear singly on all reels and even substitute for the scatter. The mini-reel on the left then has scatters added as well as 3x and 5x multipliers, so if you don't hit a blank space you'll get one of those three. All wins now pay as scatter wins, but only if they fall on one of the 30 paylines, bar the scatters themselves. Confused? It's actually quite simple - you win if any 3 similar symbols/Wilds fall on any payline in any position. You don't get retriggers for the whole 15 spins, but any 3+ combination of scatters/Wilds anywhere will add 8 extra spins. You can now hit 200x stake for 6 scatters if you land the scatter on the end single reel! You could also hit 5 scatters on the reels with a 5x multiplier on the small reel for 500x stake as scatter awards are double in the bonus. The game is very much centred on the free spins.